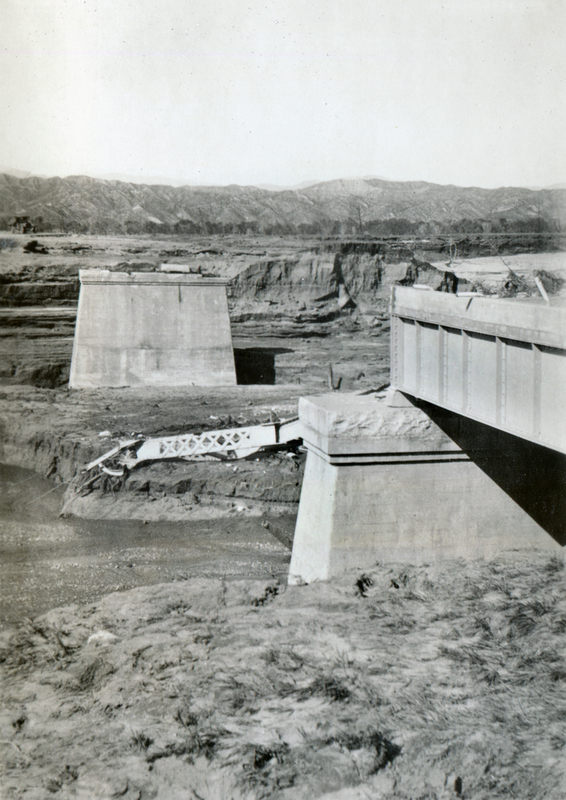 The concrete supports were all that was left of a metal-truss auto bridge at Castaic Junction after the floodwaters of the St. Francis Dam disaster swept it away in the early morning hours of March 13, 1928. The bridge spanned the Santa Clara River and was part of the highway between Saugus and Castaic. It can be seen in its original form in an early 1920s picture postcard by Western Publishing & Novelty Co. According to Ridge Route historian Harrison Scott (2002:90), the postcard publisher mislabeled it Castaic Creek. Scott (ibid. :94) also notes that the "Ridge Route" officially started at State Route 126 on the south; this bridge was just south of that. 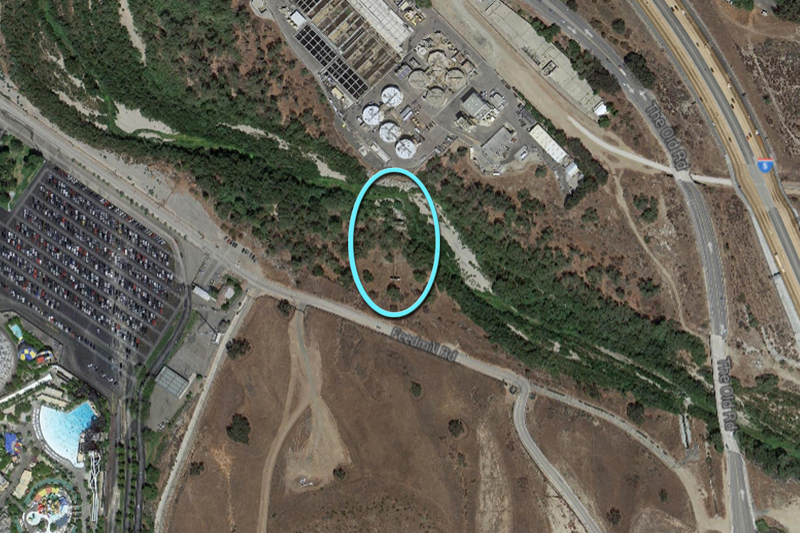 In modern context, the bridge supports are located west of Interstate 5, north of Feedmill Road (the Magic Mountain amusement park employee access road) and immediately south of the Santa Clarita Valley Sanitation District's Valencia Water Reclamation Plant. The bridge's concrete roadbed washed downriver in the dam disaster, as seen in a photograph from historian Don Ray. 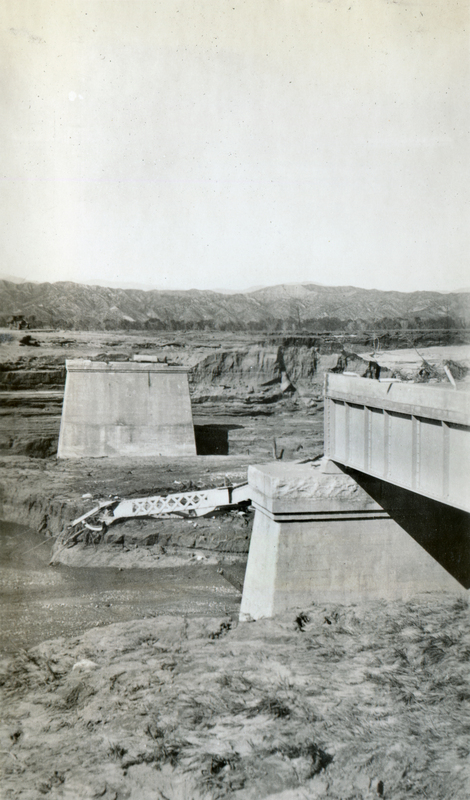 Photographs in the collection of St. Francis Dam historian J. David Rogers show that the state highway department temporarily repaired the road across the bridge. Eventually it was replaced by Highway 99 (The Old Road) and ultimately by I-5. Today (2014) the concrete supports of this old bridge don't support vehicular traffic, but they still serve a purpose. They keep various utility pipes out of the river. None of the metal structures seen today has anything to do with the original bridge; the pipes lead to and from the adjacent sewage treatment plant, which was built in 1967 to an initial capacity of 1.5 million gallons per day. As of 2014, the 27-acre facility processes 21.6 million gallons of wastewater daily. 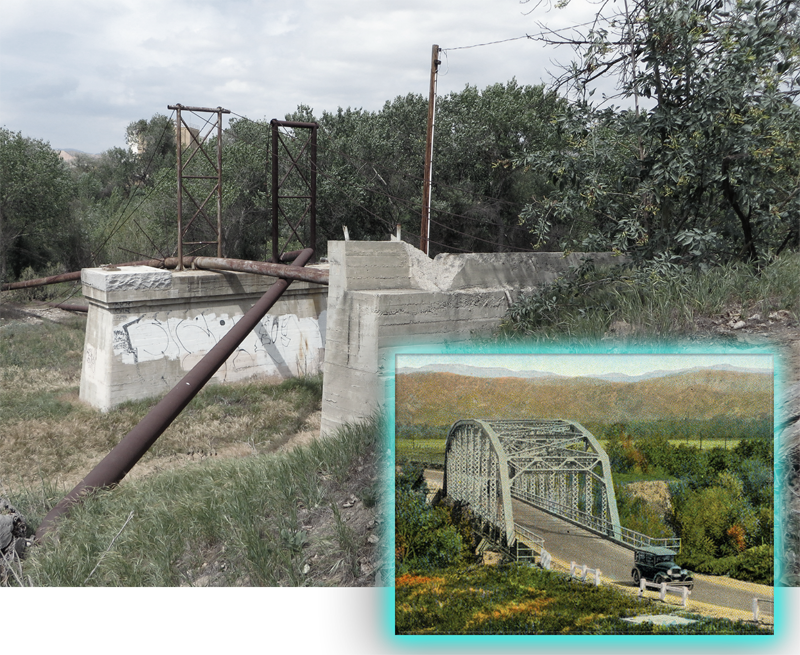 According to historian Don Ray, the round metal structure with spokes and barbed wire, seen in some of the photographs, was installed to prevent people from crawling along the pipes to cross the river. EJ2807: 19200 dpi jpeg from original 2.5x4-inch print. Archival scan on file.